A medicinal mushroom with the name “bearded tooth fungus” may not sound like something you want to eat. But adding it to your diet could support cognitive function. Lion’s mane mushroom — also known as “bearded tooth fungus” or “hedgehog mushroom,” (or hericium erinaceus in the fungi kingdom) — grows wild in North America, Europe, or Asia, but you may also find it in many nootropic supplements available today. Its use goes back hundreds of years in traditional Chinese culture as a tonic for supporting overall health and longevity. Fortunately, its use has spread from China and Japan, and it’s now easily available to anyone who wants it. Here’s a closer look at some of the benefits of this fantastic fungus — all of which are supported by research. At any given moment, how many tabs do you have open on your internet browser, and how many screens are you looking at? As a fast-paced society of multitaskers, it can be difficult to concentrate on one task when you really need to. It’s said that lion’s mane mushroom is one of nature’s most powerful brain foods because it helps stimulate nerve growth factor (NGF) production (1). NGF is a neuropeptide that helps maintain neurons, which are the cells responsible for helping your brain process and transmit information. So, whether you need to study for an exam, write a paper, or focus better at work, the neurotrophic benefits of lion’s mane mushroom may help. One of the most discussed benefits of lion’s mane in online forums is the steady energy boost it provides without the jitters of other stimulants. In fact, our friends at Four Sigmatic have even created mushroom coffee with lion’s mane, so you can take advantage of the energy boost without suffering the caffeine crash later. There’s a few reasons why lion’s mane may help with energy. First, lion’s mane contains antioxidants that support overall cellular health (2). Since energy transport takes place between your cells, the more antioxidants you have in your diet, the easier it is for your body to produce energy. Secondly, lion’s mane has been shown to reduce lactic acid in the blood, which may cause fatigue after intense physical activity. It also promotes increased tissue glycogen content which promotes energy production (3). Studies show that eating or supplementing with lion’s mane mushroom may help improve insulin sensitivity. Lion’s mane has natural antibacterial properties that help protect the gut against harmful bacteria, such as H.pylori (4). Lion’s mane has also been shown to reduce inflammation in the GI tract. You can cook lion’s mane mushrooms in butter and eat them whole, boil them in hot water, or take lion’s mane extract as a nutritional supplement in capsule, tablet, tincture, and powder form. Most health food stores carry lion’s mane mushroom supplements. 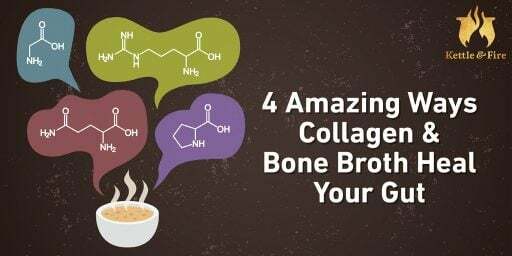 Our favorite way to take lion’s mane mushroom is by adding it to a warm mug of bone broth, which is why we came up with a bone broth flavor to share with you — Kettle and Fire Mushroom Chicken Bone Broth. 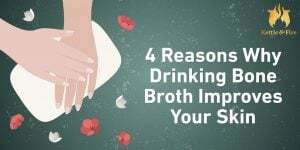 It’s slow simmered lion’s mane and portobello mushrooms, combined with all of the goodness from our classic chicken bone broth. We can’t think of a better (or more delicious) way to get your lion’s mane mushroom fix.